"Make your turkey extra special with this perfect turkey gravy. Great flavor and smooth." Place the turkey gravy mix and flour into a saucepan, and gradually whisk in water, then turkey drippings until the mixture is smooth. Bring to a boil over medium heat, stirring often, reduce heat to low, and simmer the gravy until thickened, about 10 minutes. B+. Good recipe although no need for so much flour- a few teaspoons will suffice. I used the broth and drippings from a heavily seasoned bone-in turkey breast that I made in my crockpot. Extremely easy and delicious! 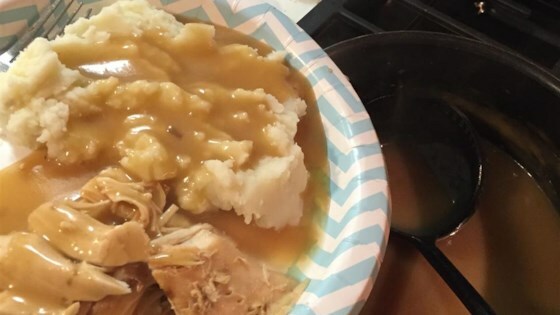 made this gravy for the first time on thanksgiving day-it was AWESOME-NO LUMPS!! I've never been very good at gravy...until now! Easy and delicious! Quick and Easy Gravy - and the best part is...it tastes like you slaved over it !! This gravy is perfect! It's super simple yet so flavorful. I will definitely make this again!